Lately I’ve really been getting into the spirit of what the tattoo community can accomplish when they band together and work for a common goal. Across the world, I can say with all honesty that tattooist so often seem to be some of the most sincere, hard working and charitable people around. Don’t believe me? Take a quick Google search on the topic of tattooists and charities and you’ll quickly have evidence of the vast groups of artists out there helping out to make changes. 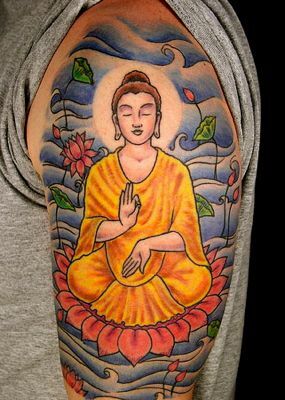 One of the most recent charities that I’ve heard of involving tattoo artists is this coming October’s Tattoos For Tibet. On October 7th, 2010, tattoo artists from around the world will be joining forces to commemorate the 60th anniversary of the Chinese occupation of Tibet. On this date, tattooists who take part will be asked to donate their wages from at least one tattoo that they do to Students For A Free Tibet. They will also be asked to donate one piece of Tibetan-art inspired flash, which will be auctioned off and from which the proceeds will also go to Students For A Free Tibet. So far there’s a decent sized list of tattoo artists who have signed up to lend their skills for a great cause this October. This will be a event that takes place worldwide, which of course makes it even more interesting. If you’re a tattoo artist who would like to be involved in Tattoos for Tibet this October, then you can get all the necessary information on how to do so by visiting their myspace page.